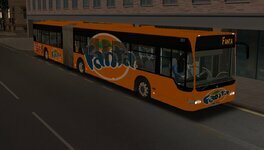 This fictional repaint texture includes all over branding for Coca Cola and Fanta soft drinks brands for both Citaro O530FL and O530GFL buses. I hope you enjoy using them. I am planning on adding additional brands to this package in the near future, if these are well received. These files may not be charged for where offered for download, directly or indirectly. You may not attempt to pass off any of this content as your own creation, either on its own or as part of some other work. Added repaints for Diet Coke, Pepsi Max and Pepsi. Removed update 1.01 due to a bad file.